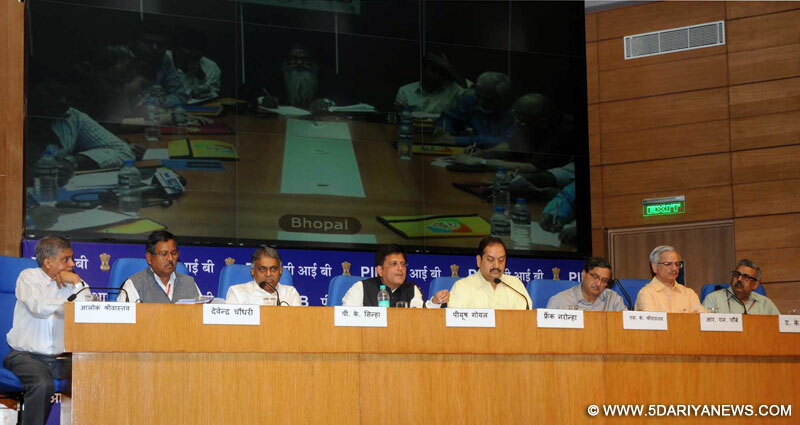 Piyush Goyal addressing a Press Conference on the initiatives taken by his Ministries, the Press Conference video linked to NIC studios located at Srinagar, Jammu, Chandigarh, Jaipur, Bhopal, Ranchi, Mumbai, Pune, Nagpur, Hyderabad, Patna, Kolkata , Lucknow & Guwahati, in New Delhi on September 07, 2014. The central government is ready to implement the proposed ultra mega solar power project (UMPP) in Sambhar, Rajasthan, and is awaiting the state government clearance, Power and Coal Minister Piyush Goyal Sunday said.“We are ready to implement the project as soon as possible if the state government gives the clearance. We are also ready for setting up project elsewhere to generate solar energy on a large scale if the state government provides us land,” Goyal said at a press conference here on the achievements of his ministries in the first 100 days of the NDA regime.The proposed 4,000 MW project in Sambhar near the state's capital Jaipur salt lake was announced last year by the previous UPA government.The state government has voiced environmental concerns about the project in an area adjoining a lake that is a prime site for migratory birds. Regarding the solar power potential-rich state of Rajasthan, Goyal said the problem of power theft was acute and he had discussed the issue in detail with Chief Minister Vasundhara Raje.“Power theft is tremendous in Rajasthan. It caused huge losses to discoms, almost Rs.55,000 crore from 2008-2013. I have discussed the issues with the CM and we are working out on plans to address the issue,” he said.The minister said that the government intends to provide round-the-clock electricity in the state, and there are ways to make power available to its remote areas.“Local needs can be fulfilled by generating and transmitting wind or solar power to remote villages and hamlets. There are several things and we are working on it,” Goyal said.